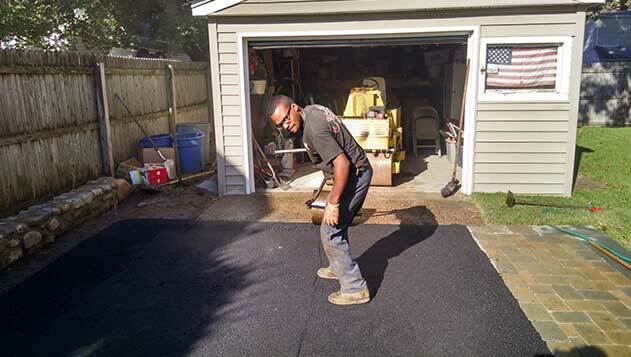 Get instant access to reputable Ramsey driveway paving and repaving services when you call us at (201) 327-5258 today. We will send one of our driveway paving specialists to your home to give you a free estimate, then provide a comprehensive solution. Learn about our current online sales and coupons when you click here now. Although your driveway may seem like just a convenient place to park your vehicle every day, it is a lot more. When there are no cars in the driveway, it can add to the aesthetic appeal of the property, or it can take away, depending on its condition. Like any paved surface, your driveway will fade, crack, and break down over time, and eventually repaving will be necessary to bring it back to its original state. Interested in what others in your area are saying about our driveway services? Click here to read online reviews! Whether you are having a new driveway paved or the existing one repaved, preparation is the key that will determine whether the project is successful or not. With new driveways, it is important for the contractor to arrange for the utility lines to be marked, so they don’t end up rupturing a sewer line, cable line or gas line during the construction. Next, there is an excavation process to go through to ensure the material underneath the asphalt is stable and won’t cause the driveway to fail prematurely. Evaluating and preparing the base that the new pavement will go over is a crucial step that can’t be rushed. In the end, the driveway must be level and there must be adequate drainage so water can’t pool on the surface or run toward your house. Asphalt doesn’t completely harden, so the base underneath is of significant importance. A quality repaving job on your driveway will create instant curb appeal that will make the entire property look better. If you are considering selling your home, or if you just want it to stand out amongst your neighbors, repaving the driveway is a budget-friendly option. As long as the existing driveway doesn’t have extensive damage, the process is fairly straightforward for an experienced contractor. Repaving creates clean-looking lines and adds a crispness to the property that really makes it stand out. You may also want to add concrete curbing or Belgian block curbing to your property at the same time for more dramatic results. If you’re interested in adding strength and character to your driveway, call McFarlane Asphalt today at (201) 327-5258 in Ramsey, NJ and the surrounding area. We will provide the solution you need for your driveway to be the envy of the neighborhood.